Have you seen that? 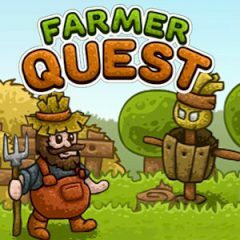 In this game you are going to help farmer to save his harvest and kill all the enemies. Just solve each puzzle and get hearts and weapons that will help you to survive. Be ready for many foes and try to use all your skills in order to become the winner. This time you will experience the newest quest. This is a farm, where you will face to so many enemies. Just do everything to stay alive and kill them all. Well, if you think that your task is just to take a weapon and fight? Hm. No. you must solve puzzles and get lives, weapons and many other useful things, that will help you to win. There are several levels and in which of them your task is to kill all the baddies and have so much fun! Just try to do everything right and you will cope with it. Are you ready for that? Then do not waste your time and go ahead.